Renting a car in Ireland is the ultimate way to experience the country. And while driving in Ireland is a wonderful experience, the actual car rental in Ireland can bring some ugly surprises! So when you are planning a trip to Ireland, don’t just search on the internet and book the cheapest rental car rate out there. Take a look at some of these important considerations for renting a car in Ireland first! Speaking from experience, we guarantee that you’ll be thankful you took the extra time to understand the process and weigh your options. Renting a Car in Ireland – a Smaller is Better…but Beware! In the States people tend to think that bigger is better, especially when it comes to rental cars. But that’s not the case in Ireland, in fact, you will likely want the smaller car? “Why” you may ask? Quite simply, many of the roads are narrow — I mean, really narrow! Especially on the beautiful country and back roads, the ones you quite possibly will want to drive on. Driving the narrow country roads in Ireland! However, when they say compact car in Ireland…they really mean it! Look carefully at the description of the rental car, and specifically how many people and suitcases can fit inside. You don’t want to accidentally book one of those tiny toy-looking cars and then not have enough room for a suitcase because there isn’t even a trunk! In Ireland, and actually many countries around the world, manual transmissions or “stick shifts” are actually the typical cars driven. Personally, I love driving a stick shift. But I also have many friends who don’t like them…or don’t even know how! The last thing you want is to be surprised in a foreign country (where they drive on the opposite side of the road…and opposite side of the car) and realize you need to master that mysterious stick shift. If you want an automatic transmission, you will need to do a specific search for it. Not all companies offer them, and if they do, then you will also be paying a higher price for the car. Keep this in mind if you tend to search online and book the lowest price you see! The truly worst part about renting a car in Ireland is the insurance. There are loads of insurance options in Ireland, and many of them are mandatory…including the Collision Damage Waiver (CDW). Many savvy travelers simple waive the CDW coverage from the rental agency because they can often use their credit card. However, this is not often possible in Ireland. Unfortunately, Ireland is one of the few place where most credit cards exclude CDW coverage! To my knowledge, I think even American Express doesn’t cover CDW in Ireland. Recently, I read that Chase Sapphire (an amazing and one of our favorite travel credit cards) reversed their exclusion clause, and now cover CDW in Ireland. This is great news because we LOVE using our Chase Sapphire card to earn travel rewards. However, we’ve yet to test out this card in Ireland. ** NOTE: From my research, if you do want to use the Chase Sapphire to cover your CDW, you will have to get a letter from Chase to confirm this and show it to the rental agency. You might even want to contact the rental agency before your trip to verify that they will accept this letter. Some rental car agencies in Ireland will still refuse it, and will require you to buy the additional CDW. (This is actually what happened to us when we rented a car in Ireland a few years ago). If you know they won’t accept your letter of coverage prior to your trip, perhaps you can try a different agency. For us, we found out when we arrived and didn’t want to fuss with searching for a new rental — so we paid it (GRRRR!). They Will Put a Hold on Your Credit Card…a Big One! When renting a car in Ireland, it is also standard procedure to put a fat hold on your credit card — sometimes upwards of $3000+ (depending on the agency). This can be a real problem for travelers, especially if they are paying for a lot of the trip on their card (flights, hotels, food, etc.). I always recommend having a few different credit cards and payment options when you travel, and it’s definitely an important thing to consider when renting a car in Ireland. It is also critical that you NOT use a debit card, but an actual credit card. The last thing you want is to have them actually remove that sum of money from your checking account. With a credit card, you don’t notice it’s being held (unless you are at your limit and need to use it). You know things must be a little rough on the roads when there is yet another insurance waiver…and especially when it’s called Excess Damage and Super Damage! This is another “extra” that you may choose to buy, and it does reduce your cost & deductible a lot if you damage the car. But it is quite expensive to buy! Another consideration is that in some instances, this additional coverage might waive excess “hold” fees placed on your credit card. ** If you have the Chase Sapphire, you shouldn’t need this extra coverage either. Side note – you may be wondering why all the required insurance and hassles in Ireland. Well, it just goes to show you that driving in Ireland isn’t always a piece of cake. From narrow roads, lots of rain and rocks…and many tourists driving on the opposite side of the road (and car…with a stick shift) — well, you can guess there’s a lot of damage that happens! Narrow roads and rock walls…be careful!!! Similar to what we wrote about renting a car in Mexico, a lot of online car rental companies will hide a lot of the required insurance prices to make the price look cheaper. They know that most people look and sort by the lowest possible price. But always, always read the fine print! You should read through all the inclusions in that rate, and go through the booking process to see what the final charges will be after adding all the required insurance. Sometimes the cost of the full insurance can double or even triple the total price of the rental! If you are having a difficult time finding the total price of the rental all the required insurance, or if you are having trouble even finding out what exactly the rental price includes, then I would recommend going with a different agency. The last thing you want is an ugly surprise when you arrive in Ireland. When driving in Ireland, be sure that you have a hefty budget for gasoline or petrol. The prices in Ireland are steep, and remember petrol is sold by liters, not gallons (like us Americans are used to). Even though most cars in Ireland will get much better gas mileage then a car in the USA, depending on how much you are driving, the cost can definitely add up. Also, some of the roads (especially around Dublin) are actually toll roads. Some airport rental agencies will automatically charge a fee to cover your tolls (there should be sticker thing in the car for tolls). If you have paid this through the rental car agency, then don’t stop to pay cash at the tolls — or you would be double paying! Good News – No Special License Required! On a Final Note — Renting a Car in Ireland is Totally Worth It! I don’t want to seem all bleak in this post, because renting a car in Ireland really is an awesome way to see the country. While we enjoyed sightseeing in Dublin, it was so nice to get out of the city and explore! We loved having the car and zipping about and explore on our own terms. It was a wonderful trip, and we can’t wait to get back there and rent a car again. But having this extra information will help you to be prepared when you are planning a trip to Ireland, so you know when to look for when booking your rental car in Ireland. Editors Note: This post was originally published in February 2016, but has been revamped and updated. To check rates for renting a car in Ireland, click on the banner below to search our partner rentalcars.com. Compare rates from multiple companies in one easy tool! Popular Ireland Activities – Book in Advance of Your Trip! Hi! Heading to Ireland in a few short weeks – what agency did you use and is there one you would recommend? Hi Kelly – thanks for reading, and for the comment! It was a couple years ago that we went (before we started the blog), and I can’t quite remember the name of the company! I want to say it was Hertz or Thrifty. I do remember doing lots of research and I thought I had found a company who said we could bring a letter proving that we had the insurance through our credit card (Chase Sapphire). However upon arrival, they refused to accept it and forced us to buy the extra insurance anyway 🙁 My parents were actually in Ireland with us too, and they rented a car through a different company and had the exact same problem as well. So honestly, I think it is up to you and what company you feel most comfortable with using. I think they are all a bit difficult to work with regarding the insurance. If you do find one and have a great experience…PLEASE SHARE with us to let us know how it went. Hopefully we can get back to Ireland sometime and give an update ourselves. Thanks again & happy travels! ** PS – I’ll keep looking in my notes and if I find a receipt of the name of the company I’ll be sure to update this post and comment thread! Have you had any experience with or heard of the particularly Irish phenomena known as the “bumped tire”. I have no idea what the criteria for a “bumped tire” is and, we’ve been lucky to have not been afflicted with the malady but, we witnessed two fellow Yanks really going to town with the rental folks about the “bumped tire”. We never got any info regarding BTs but, it sounded very expensive. The best advice that we got, regarding driving on the Island, was at the rental car pick up counter. Another Yank told us, “You’ll be seeing a lot of lovely hedges on the left side of the roads you will be on. Every one of those hedges is hiding a rock wall. Don’t get too close.”. Thanks for reading Michael – and the comment! I have not heard about bumped tire, but I’m definitely going to look it up! One time (in Scotland) we did have a cut tire (not a flat – but cut enough that they made us buy a new one after turning it in). It was likely from a sharp rock on the side of a narrow road. I don’t know if it’s the same thing though. And you are VERY right about the hedges hiding the rock walls!!! Narrow roads and rock walls are everywhere, even if it just looks like soft foliage. Definitely better to be on the safe side and steer clear of them. When I turned in my rental car at the Dublin airport, the agency clerk was making a fuss about scratches on the wheels. I don’t know if they were already there or not, but I got stubborn about being blamed for wheel scratches. I asked the guy if he had ever driven on their roads.. he may have been just a city boy. After that he backed down and we were not charged. Hedges seem to be designed by the car rental places..
Hi Patrick – thanks for reading! That’s a bummer to hear. We actually had a similar situation with a rental car in Scotland. We didn’t even know there was a cut in the tire, and they contacted us after we left the country with a fat bill! Just one of those things I guess…still had a lovely trip though. Thanks for sharing your story and best of luck on your next adventure! It may seem fun to drive a manual, but remember you’ll be changing gears with your left hand while getting accustomed to the rear view mirror being on your left and no side door mirror near you on the left, all the while driving on the left with cars and tour buses coming towards you on narrow, winding and many times mountain roads or through small towns with streets only large enough for one car. Quite the experience – definitely rent a car! It’s an adventure! Even an adventure for the passenger riding so close to those walls! Ha, ha! Steer clear of the hedges? Is that a pun?? You have to hit the hedge or an on coming bus! Those roads are narrow. But we came back in one piece, and the best time (and food) I’ve ever had! Can wait to go back! Good advice. AMEX does cover the CDW. That upgraded car will cost you 10-16 euros per DAY extra! Went to Ireland in October 2016. Talked with the manager at the thrifty rental car at the Dublin branch, to see what could be done not to have such a large deposit held on my card. I simply bought full coverage on the car, no deposit required, only cost €100.00. Well worth the price. Thanks for reading Shawn, and for sharing your experience with us! It’s good to know that they gave you another option that worked better for you. It can definitely be a shock if people aren’t prepared for it. Hi what car rental company was that? It’s been a number of years since we took this trip, and I am not positive which company we used. I believe it may have been Hertz, Enterprise, Avis or Budget. However, this information applies to most of the rental agencies in Ireland — as we shopped around a lot. Also, my parents were with us and they had the same situation with their rental agency too…and they used a different one than we did. Thanks for reading Debbie! That is wonderful to hear, we are so very happy to know that we can help others. Wishing you a wonderful trip and feel free to reach out if you have any other questions or want help planning your trip. All readers should thank you for this! I wish we had this information before going to Ireland for our honeymoon 10 years ago. It was quite the nasty surprise to our wedding/honeymoon budget when we had to pay the exhorbitant insurance price required by the rental company after booking what we thought was a bargain online! Between that and lost luggage on the flight from the US, it started out pretty badly, but seeing the country on our own schedule with only our own agenda was the way to go. Overall, it turned out to be a wonderful trip. Thanks so much for reading Carole! I’m sorry to hear about your trip – that is a real bummer, and definitely not the way to start a trip (or your honeymoon!). That’s definitely one of the reason’s we wanted to share this information with other travelers – we don’t want them to have a bad experience. But I am glad to hear that you enjoyed your trip. Ireland is a beautiful country, and it really is SO much more fun when you have the freedom to explore it on your own. I would recommend that if you are going to travel into Northern Ireland as well, see if you can get a car with both kph and mph on the speedometer. Not easy to convert from kph to mph while driving. That is a very good point Annie! Thanks so much for reading and sharing this info with us. Many people don’t realize that they use MPH in Northern Ireland – it definitely seems strange! Thanks for reading and for the comment. From what I have read, you technically don’t need an international driver’s license to drive in Ireland if you are from certain countries, like the US or Canada (although the rules can change). However, some rental car companies will require that you have an international driver’s license – so it will depend. I recommend researching car rental companies thoroughly and double-check this before you arrive. However to be safe, you can get an international drivers license quite easily. It doesn’t cost much and you can do it online or go down to a local AAA office and get it in just about an hour. Super simple, and it will save you the headache of worrying. Lastly, you will need to contact AmEx directly and ask them if they cover rentals in Ireland. Last time I checked (a couple years ago), they did not cover Ireland. Also remember to ask if you can take your rental car across the border into Northern Ireland and visa versa. We were casually talking about our plans with another family and the clerk at the rental desk informed us that the rental agreement only covered the car in the Republic of Ireland. We would need to purchase other insurance to go across the border or rent from another company. Unfortunately, I can’t remember what agency it was but it was quite a few years ago. Since then I always ask before confirming a rental in Ireland. Most times it is fine but the time to find out is not when you have an accident. Thank you for reading Kathy — and for your very important comment! You are right, not all cars can go over the border and sometimes they might not be covered. Definitely important to ask these kinds of questions of your rental agency, regardless of where you are traveling. Even in the States, you should double-check that you can take your car into Canada, etc. So it applies everywhere. Another thing to note that we ran into- if you purchase the car/insurance through Travelocity they will also not accept that insurance. Travelocity ended up refunding our money, but it took a long time, a lot of hassle, and I don’t think they even gave us the full amount paid back. (They don’t itemize everything on the Travelocity receipt, so I will never know for sure). We unexpectedly had to add over $700 to our bill for the car (we upgraded when we got there… like you said they are much smaller than you think) between the upgrade and the insurance. I do agree 100% that it is worth it and I would do it again in a heartbeat to drive through the beautiful Irish countryside. Thanks for reading Susan, and for your insight! It’s interesting to hear that Travelocity is selling insurance for a country that doesn’t accept it…good to know! I’m glad to hear that they refunded your money, but what a pain to deal with. Happy to hear that you enjoyed your experience and that it was worth it. I can’t wait to return to Ireland and go for a drive myself! We were just in Dublin in January and rented through Enterprise. The entire bill for 24 hours was just over $100 and included a GPS unit and full coverage insurance. It’s not nearly the nightmare this post makes it out to be. Thanks for reading and for the comment Kate. Glad you hear that you had a great experience, and that the price of $100 for 24 hours included all the necessary insurance. For a week-long trip, the price can definitely add up. Great advice! I’ve been digging for the bottom line on these rentals and it’s like running a gauntlet! Any advice for a group of 7? We were going to rent a van but am wondering if two small cars would be the better choice. Sounds like we may need to sell some stock to pay for it though! Thanks for reading Jen! It depends on where you want to drive. If you plan to stay on the main highways, then a larger vehicle like a van is fine. However, if you prefer to drive on the country backroads, and the windy roads of the Peninsulas (like Ring of Kerry or Dingle) — then I definitely recommend getting a couple cars. It would make those drives more enjoyable for the passengers, and the driver 🙂 You certainly can take a van on those roads (you’ll find lots of tour buses on the Ring of Kerry)…but I don’t think I’d want to drive something that big around there. I Was in Ireland in 2005 and rented a car. At that time if you were 70 years or older you could not rent a car. My traveling companion was over 70 and so I I rented a car at that time and Drove a stick shift on the wrong side of the road, on the wrong side of the car, not an easy feat to say the least! Does the age limit still apply? I think she means if you are OLDER than 70 you cannot rent a car. In Canada you have to be older than 25 and there is no upper age limit – I suspect the US is the same. Some countries you can only rent a car if you’re between 25 and 70. Ireland may be one of those! Either way thanks for the very informative post! We got our car and extra insurance with our travel agent. We also requested an auto transmission. Our rental company was Don Dooly and for a small charge we were able to rent a GPS that had everything already pre-programmed into the device. The GPS and auto transmission were a bonus because so much focus was required to drive on the “wrong” side of the road. Hi Michelle – thanks so much for reading and for sharing your experience. And you are right, it definitely takes focus to drive on the “other” side of the road (and car) — so having the GPS is very handy! Happy travels! Hey there! Thanks to your information, I realized we might be able to get out of the CDW because we have a Chase Sapphire Reserve Card. I just got off the phone with Chase and I have my letter of proof of coverage. Here’s hoping the Sixt Rental Company in Dublin accepts it! That’s awesome Pamela! That’s a really GREAT travel credit card – we love ours! Please let us know how it goes – it’s always good to hear from others’ experiences too. Happy travels! Thank you so much for this. I have a Chase Sapphire and didn’t even think to use it until I read this! Thanks for reading Sarah – I’m so happy to hear that you found it helpful! Cheers and I hope you have a fantastic vacation! Thanks for reading Shanna – we are glad that Pinterest recommended it to you and that you found it helpful! We hope you have a wonderful trip to Ireland!!! I would double check the chase sapphire car rental coverage. They will cover the car you’re driving but they don’t cover medical expenses or damage to another car. Think excess coverage is the way to go! Great read thanks for sharing! That’s a good point to consider. We travel with medical insurance too, but it is good to keep in mind the expenses of the other car as well. What a great recap! I would note one more thing – if your plans include driving into the north make sure you tell the agency ahead of time. Some agencies still have restrictions around driving into the U.K. I’ve had a few issues with that in the past. Thanks for reading Nicola and for the comment! You are very correct, make sure you to tell the agency (and be sure you are allowed) to take the car into Northern Ireland. Not all of them can go there — and you don’t want a surprise later! Jut returned from eight wonderful days in Ireland. This was my third trip to this lovely country. I have rented from Dan Dooley Car Rental each time and have had very positive experiences. I always buy the full coverage insurance which eliminates the need to put a hold on your credit card. Make sure you get the coverage that includes tires and glass. Picked the car up at Shannon this time and returned to Dublin. It is just easier getting acclimated to driving on the left on the less traveled roads outside of Shannon. It really doesn’t take long before you are feeling like you’ve always driven on the left. Dan Dooley was easy to work with and I was able to pay for everything in advance, so there were no hidden surprises when I got to the rental desk. The only thing to be aware of is the Dan Dooley location isn’t in the terminal at Shannon. You will have to take a shuttle to their office which is about three minutes from the airport. The shuttle arrives every 15 minutes or so just outside the terminal at Shannon. Driving is definitely the best way to see Ireland. It allows you freedom to explore and discover out of the way locations you just can’t see any other way. Can’t wait to go back soon!! Thanks for reading Rachael, and for sharing your positive experience with all of us! It’s always great to hear when our readers can add to the conversation too — that’s our goal, to make this a place where we can all help each other with advice from our own experiences. I’ve actually heard of Dan Dooley as well (although I didn’t use them), so it definitely seems like a popular and reputable company. Thanks for sharing and glad you had an amazing visit to Ireland! Just got back from Ireland & rented a car. This article was a lifesaver. I had everything ready with no surprises. Thank you for posting such a funny but informative article. I cant wait to go back! That’s so great to hear Candace – and thank you SO much for letting us know how our article helped you be prepared for your trip! Ireland is a wonderful place to drive…but you do need to be prepared. I’m so glad everything went smoothly and that you had a lovely time. I hope you get to go back soon (I can’t wait to return too!). We are flying into Dublin and staying in Dublin for two days. We were going to take a cab to the hotel and not have a rental car while in Dublin. On the Second day, we are heading to Dingle and want to pick up a rental car somewhere near the O’Callaghan Davenport Hotel. Any ideas for the best rental company in Dublin. (not at the airport)? And we want to return the car to the airport at the end of our trip. Should we go back to the airport and rent there? Do you think the rentals at the airport are more reasonable? Hello Maureen – thanks for reading and for the question! That sounds like such a great trip! One car rental agency which has good reviews (from other readers here) is Dan Dooley car rental agency. I haven’t used them myself, so I can’t personally attest to them — but I have definitely heard good things from other travelers and seen good info online. I believe Dan Dooley has an agency in the city center of Dublin as well as at the Dublin airport too. Perhaps you can ask them if you can rent at one and drop off at the other agency – that would save you from going to the airport. Please let us know how it goes so I can keep this in mind for my next trip to Ireland! 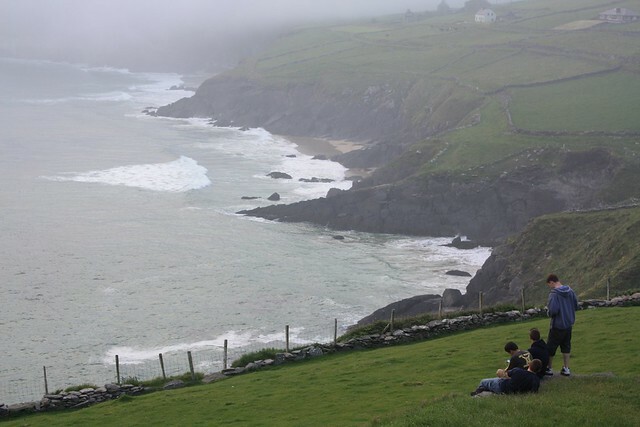 Happy travels to you — Ireland is an amazing place to visit!!! Just returned from Ireland and Scotland. Your post was spot on. Driving was tricky and sometimes,with the semi trucks,seemed like an Olympic sport but well worth it. I would do it again in a heartbeat. We just got back from Ireland. Driving on the left is not for the faint of heart. Everything about narrow roads is beyond true! We rented a van for 6 people in Shannon from Dan Dooley and couldn’t have been happier. They were kind and funny and out us at ease from the beginning of our trip. We used a GPS which took us out of the way and down teensy farm roads so I would also suggest a map or some kind of travel pass on your phone for google maps. We saw lots of things we wouldn’t have using the GPS so no complaints. Ireland is the most beautiful and peaceful place in earth. I am planning a trip back already! Thanks so much for reading Kathi – and for the comment and for your tips too! You are correct, there are SO many great places to see when you get off the beaten path in Ireland. Having a vehicle makes it so much easier, and I also definitely recommend a GPS of some sort (either renting one from the agency or using your cell phone — if you have an international plan and can get signal, because you can’t always get service in rural areas!). So a back up map is always good too. We used the letter from Chase but be sure it’s not more than 30 days old. We had to wait for Chase to fax another one to the rental company. Also, be sure and check the tires and wheel covers when renting. We had a low pressure light come on while driving and stopped to have it checked and discovered two of the tires had broken valve stems and one of our wheel covers was held on by stay ties! We were able to travel on but that could have been a problem. Thanks for reading and for the comment Suzanne! Good point about the letter from Chase, it’s interesting to hear that they enforced it and made them fax another. Also a good tip about the tires — you always should check your car carefully when renting, especially in another country. I’ve been to Ireland 3 times and rented from 3 different companies. I recommend Hertz or Europcar. Hertz covers tolls and didn’t have extra hidden fees that I remember. Don’t be afraid to venture up to Northern Ireland, Giants Causeway is gorgeous. The last visit in September 2017 we rented from Europcar, the only company that would let us pickup in Dublin and drop off in Belfast. Not only is it stressful to drive on the wrong side of the road, with a manual, and with your left hand, but add roundabouts and making a right turn! Right turns in Ireland are our Left turns! I recommend reserving a car and specifying an automatic in advance, don’t expect to walk up to the counter and ask for one, you’ll be disappointed. Ireland is beautiful and well worth renting a car and exploring the country. I’m already planning my next visit! Hi Joy — thanks so much for reading and for sharing your experience with all of us! We’re glad that you’ve had great experiences and appreciate the details about renting from Europcar so you can pick up in Dublin and drop off in Belfast. We wanted to visit Giant’s Causeway, but just couldn’t get there! Good point that you must reserve the automatic transmissions in advance, they are few and far between. You can’t just expect to get an automatic when you arrive, a lot of people make that mistake! Thanks again & best wishes on all your future travels! but wondered if you have any negative thoughts about going to Ireland in the Oct-Nov timeframe. We are planning a 3 week stay between Ireland and UK. And we plan on renting a car from different agency in England, etc. Hello Joyce – thanks for reading and for the comment! I apologize for the delay in responding, we were in China for a couple weeks and internet is difficult over there. Overall, the earlier the better if you want decent weather. If you stay in the car, it’s less of a problem but if you want to go outside and walk around, it’s amazing how the temperature combined with wind and rain can make it unbearable in Ireland — especially along the coast. Compared to England, I definitely think Ireland gets more cold and rainy (at least from all the times I have visited both places). Even the end of May into June in Ireland we encountered some very cold, windy, and wet times in Ireland — making it difficult when we wanted to do just a bit of exploring outside. Overall, I think September would be a lovely time — but if you want to save some money and don’t mind bearing the cold, then Oct-Nov would work too. I hope this helps. Have a wonderful trip!!! Hi. Interesting article. A few points from a native. Renting a car in Ireland is pretty much the same as anywhere in Europe. Basic insurance is always included but it usually is subject to excess charges for which the renter will be liable. This varies from company to company and can be as high as 3000 euro but more likely to be less than 1500 euro. Extra insurance can be bought to reduce or eliminate it. The rental company will stop a deposit on your credit card but it usually is only in the 200 to 350 euro range. I relation to car types most will be saloon type and typically seat 4 adults or two adults and 3 children. Beyond that you need to look at MPV or minibus styles. If travelling with a lot of luggage look for an estate (station wagon) or hatchback at least. If your booking a car on line go to the local website for Ireland (.ie) or contact the Irish office directly. Most problems with bookings occur because the international or north american booking sites dont adjust properly for the local conditions. Ireland now has a good motorway system connecting Dublin with most of the regional cities and tolls exist on most so bring some euro coins or notes. The M50 is an exception as it has electronic tolling and the easiest way to pay is on line within 24 hours. Unpaid tolls are doubled for every day they remain unpaid so do it immediatly. You can pre buy trips if you think you will be using it a lot. Weather wise its impossible to predict long term. The country has a mild maritime climate which gets a bit of every type of weather though seldom extremes. Bring a selection of clothes especially rain proofs. Layers are best so you can peel off or put on as required during the day. The good news is the weather is usually mild and always changing. As a tourist be very careful driving for the first day or two. Most serious accidents happen in this period when people forget they should drive on the left. If you are driving on small narrow roads as a tourist have some consideration for the locals. You might be on holiday with no time pressures but the locals all have their normal busy lives to live so let them pass as soon as its safe. Enjoy you holiday. Ireland is a lovely country to visit. Hi Dermot – thanks so much for the additional information. It’s quite helpful to have these tips from a local. Ireland is an absolutely beautiful country for driving. It’s been one of my favorite road trips for sure! Thanks for reading and happy travels to you! Went 8 times rented cars. Automatic is def. more. We bought packages then another 2 daughters bought then last 2 bought. I had automatic and I telnet to reach b&b’s to book added. I asked for a van it was really a SUV here. Said 4 pcs. of luggage we had more. Thy took all 3 cars and my extras and cost $250 add’l after trading in 3 cars and ins. hundreds more I wanted no surprises. I had a accident once Land cruiser hit me as I pulled out into rd. . Their mirrors should be reversed as driving on left but they aren’t, so cars are closer than you believe should be actual view. No one sited on scene he drove away, I needed a new car. Had to stay close and wait and then driver delivery man back! Also when 8 got home I was judged at fault and $2000 tacked onto my CC, now might be $3000….I had a flat hitting curb sticking out had to tow and fix it. GPS stops once you go over into Northern Ireland, another country. Used to work sour own taken into Ireland now you have to program ahead of time so had to rent along w/the internet. This is long but I learned everything the hard way. Driving out of Shannon is easier, Dublin is hard driving like NYC. In Dublin we hired cabs to get to tours etc and left SUV under hotel, parking is hard and you pay. Thanks for the tips and sharing your experience Marcia! You are right, definitely don’t need a car while in Dublin. Getting around is difficult and parking is a pain, so it is much better just to use local transportation or a private tour in Dublin. Rental cars don’t come with automobile’s manual so you definitely need to have the rental agent show you everything…our van seats moved up and down…my car’s seats back home here move front and back; windshield wipers, gas tank opening…major problems if you don’t ask when you get your vehicle. Eventually, I stopped at a dealership to ask some questions and on another occasion I asked a local who had the same vehicle…very friendly service…and people…though I am sure they each had great stories to tell. Worth every minute though…country is beautiful and driving on your own schedule is marvellous. Thanks for reading and for the comment Christine! You are correct, many things are different on the cars – so it’s always good to check things out thoroughly before you jump in and hit the road…especially when you are in another country! And we agree — Ireland is an amazing country to drive on your own. Pulling off the road and hitting up a local pub for a pint and a chat with the friendly locals is one of the best ways to spend your visit. Another thing to know when driving in Ireland. Police do NOT patrol the streets for speeding cars. Speeding is all handled via cameras. So if you speed, you will have a ticket charged to your card from the rental car company after you get home. Hi Wendy – thanks for the comment! You are correct. They do this in other countries as well, I remember getting a fine in the mail almost 2 months after I finished a trip to Italy. It wasn’t for speeding, it was for driving in a restricted area (apparently I went down a street in downtown Pisa which I wasn’t supposed to…). They will definitely mail fines to you afterwards. So do be careful! We just got back from a trip to Ireland and the rental car was the most frustrating part. We are Americans, but we live in England. We have rented cars across Europe and we have never been this shocked. For full CDW it was over €40 per day, if we didn’t take that the desuctible was €3000. We took the expensive CDW for peace of mind. When we returned the car they tried to charge us a €50 fee to vacuum the car out. The car was not excessively dirty, but we had spent a week on the coast of Ireland with 4 kids. My husband and I both pushed back on this charge and after speaking to a manager they waived the fee for us. It seemed like a complete tourist trap and made me angry. This was all with Hertz so I can only imagine the nonsense with a budget agency. All that said we adored Ireland and would recommend renting a car. Hi Amy – thanks for sharing your experience! What a bummer to hear that the rental agency was such a pain. Yeah, I’ve rented in many countries of the world and I found Ireland to definitely be more difficult than most (aside from the insurance issue in Mexico too). It is sad to have this experience, because actually driving around Ireland truly is a wonderful vacation experience!!! Cheers to you and best of luck on the next adventure! Wish I had read your article before driving in Ireland for 16 days. I made all the rookie mistakes, starting with renting a nice large Volvo that had plenty of room for passengers and luggage. Not only was it too big for the many back country roads we traveled, there was no where to park it – it didn’t fit in most spaces! My suggestion to someone going for the first time or to someone going for an extended trip of travel around the country is make sure you have multiple drivers. When you’re driving in Ireland you will need to give it 100% of your attention. It’s not like driving in the states, there’s nothing intuitive about it (at first) and it can be very stressful. With multiple drivers you can enjoy the beautiful scenery when you’re not driving! I was there some years ago and there was a limit on the age of foreign drivers. At that time, no foreigner over 75 was allowed to drive the rental car. That was an unpleasant suprise. But the beauty of the country and people made up for everything. Hello Anne – thanks so very much for reading & for the comment! Thanks for sharing your experience with us, as it really adds to the overall conversation. I’m glad you got the automatic but sorry to hear that the car was so large that it was inconvenient! And you make a GREAT point about having multiple drivers. It’s a pain when you are the only one driving and you can’t sit back and relax to enjoy the scenery. But sometimes…it actually takes two drivers (including a passenger to navigate). Great information, especially info about car insurance. I rented a car from Hertz and was charged extra for white dust on my wheels, which they perceived as damage. I only drove on the highway, so not sure what “damage” I would have. I tried to fight it, but simply could not and had to pay about $200 for white dust. Hi Tracey – thanks for the comment! That’s a real bummer that they would do that to you. I’ve lost some cases similar to that over the years during our travels abroad. There isn’t a lot you can do if a company is really difficult or flat out unreasonable. Thanks for sharing your experience! I hope you enjoyed your trip regardless! My husband and I are headed to Ireland in August. We are doing a small tour group for seven days but then have another 7 days on our own. We have been trying to decide if we should rent a car or just try to take trains or big tour buses to selected locations. We have the opportunity to book a car through our airline for a supposedly reduced rate. Have you ever done it that way or is it better to just book through the rental companies? BTW. this is our first trip out of the country so we are a little worried about what we are doing. Hello Christina – thanks so much for reading! Congrats on your first trip out of the country…how exciting!!! I totally understand how you feel, I remember being SO worried the first time I went overseas to Europe. But I’m sure everything will be just fine. Having the group tour for the first part is a great way to get familiar before heading off on your own – so I think that’s a wonderful idea. It depends on where you are going on your group tour and what you are looking to do on your afterwards. Overall, I would say that Ireland is much more enjoyable to explore on your own with a car. It will be a bit more challenging by train because so much of the fun areas are in the countryside. Unless you plan to stay in Dublin or other major cities, then you don’t need a car and take public transport or buses. However, if you want to venture outside the cities on your own then I highly recommend renting a car so you can enjoy it much more & it will be a lot more convenient. As far as renting through the airline, from my experience it’s not always the best deal. Definitely see if you can get a quoted price so you can compare online before booking. But my personal experience is that renting a car through another website is usually a better deal. ** Just be sure you have the proper insurance papers (or credit cards that cover car rentals in Ireland – they can be a pain!. I hope this helps. Feel free to let me know if you have other questions. You can always send me a message via email if you have additional questions. Great advice. We rented a car from Hertz in 2015. They were wonderful to work with. It was hard getting accustomed to driving on the other side, until a nice, Irish lady told me to remember that the white line always had to be next to me, the driver. That applies to the US too, which is good, because I was a little disoriented about driving when I returned to US. Great advice about renting a smaller car. There was a lot of flooding that washed out some of the main roads, so we had to take small one-lane country roads. Rosann – thanks so much for reading and for adding a comment! That’s great to hear that you had a good experience. It is certainly nerve-wracking to drive on the other side of the road / and car — it certainly does disorient you! Wow, that’s crazy that you had such flooding rains – but hopefully you still enjoyed the scenery along the country roads. And yes, they are SUPER narrow!!! cover purchased in advance, they tried it on in Dublin claiming that they had never heard of it before and that I would have to take extra. I stood up to them, and they backed off. Low fills of petrol are something to watch out for on collecting the car, and never return it without filling it. They charge much more for ‘their’ petrol. The GPS (SatNav) as an optional extra can be costly. I found it cheaper to buy my own in Dublin and leave it there for my next visit. The car I had booked wasn’t available when I arrived on time at their depot, but a better one was, for the cost of an upgrade. Their problem, I told them and got it without any extra charge. Don’t be in haste to get underway and instead, spend time examining the rental vehicle thoroughly inside and out. Add to their list of known damages and get them to sign for them before you leave. Take photos of the vehicle, preferably with time and date included, and don’t neglect the underneath- it crops up regularly as damage caused by you. Be aware that your insurance for the Republic of Ireland won’t cover you in the British Six Counties of Northern Ireland. As there is no hard border between them (yet) you can easily drive across without knowing it – the distances signs are different and your GPS will need adjusting to recognise the ‘foreign’ locations. The car agency will happily sell you additional insurance for this and warn that they do tracking checks to ensure that you haven’t crossed the border without insurance. Give yourself time if dropping off the car just before flying home. It’s not uncommon to find that their checker is too busy to attend for a while, so you depart for your flight without having the vehicle okayed. Don’t be too astonished to find your credit card debited for damages invisible to you, a few weeks later. If you are older than 70, you cannot get car insurance and therefore, cannot hire a car. Final warning, thieves target cars, especially those in remote tourist spots. Never leave your luggage unattended, but if you must, always take your valuables with you. I noticed a van with darkened windows that followed me into an isolated glen in Wicklow. The driver and his mate showed no interest in the views, but were intent on watching us. Oddly enough, when I waved and pointed my camera at them, they seemed to have urgent business elsewhere, and took off. Ireland is no worse than anywhere else for taking advantage of tourists who hire a car. Stay alert and let them know you’re not an Amadan. Slan an Bothar. My husband and I will be in Ireland for the first time in May for 16 nights. Flights and accommodations are booked, but want to button up our car rental. Have read through a big portion of your blog, regarding “everything” about car rentals, but have not spotted anything in regards to insurance through a private company (did I skim past it?). Saw something the other night about purchasing it separately. One of the companies listed was World Wide Insurance at a cost of $77 for basic CDW, and $84 for Super CDW. Thought it may be a less expensive way to have secure insurance, minus the larger cost. Ever heard of this? Hi Mary – thanks for reading! How exciting, you will love Ireland (aside from the pesky rental car stuff)!!! Regarding the rental car and insurance through a private company, as far as I know, it may not be accepted. However, the only way to know really is if you call the insurance company to confirm and then call the rental car company to confirm with them that you can use this other company for private insurance. Ireland rental agencies are so picky about these things, and it can actually vary by rental car company too. So that’s really about the only way to know for sure. If you find out, definitely share with us! But I haven’t found any solid information online about being able to buy private insurance like this and have it work in Ireland. And I haven’t used it myself, so I can’t confirm or not if it would work. My adult daughter and I rented a car for a week when we visited about 6 yrs. ago. Everything mentioned in this article is spot on. Believe me, even if you know how to drive a stick shift…you want an automatic and they are few and far between and generally older vehicles. I had my local AAA make the arrangements for my rental. So thankful I did because we got a flat tire while driving around the Dingle peninsula. Do inspect all 4 tires and the spare tire BEFORE you leave the lot. Our flat tire was so thread bare to begin with, I’m surprised it got us as far as it did. The spare wasn’t much better. Unlike in America, the other Hertz agencies claimed to have no extra tires they could give us, so for 2 days we were petrified that we blow another one! I ended up buying a tire in Galway and it was the last one they had in the size the car needed. When I returned the rental to Hertz in Dublin, they refused to reimburse me for the tire, and acted like it was my fault I had got a flat. Once home, I had the AAA agent communicate with Hertz International and was eventually reimbursed for the new tire. Hi Mary – thanks so much for reading and for the comment! So glad that you and your daughter enjoyed yourselves in Ireland. Sorry to hear about the tire trouble (seems to be a common issue) — but glad to hear that you eventually got it sorted. Although the article is true, it is not bad to rent a car in Ireland. I did for a week and the final price was not bad. Here are three other things to look out for. 1. Marked parking spaces are very small so a small car comes in handy. I am 6’5″ and overweight and got used to the small car. 2. I had no trouble finding parking in big cities. In very small cities, like Donegal, it was easy to park outside of the city and walk the city. In somewhat small cities like Sligo, it was almost impossible to find parking. I would not rent a car and go to Sligo again. 3. In very rural places, GPS on your phone and go out. If going extremely rural, make sure you have a good idea of where you are going beforehand. Hey Patrick – thanks for reading and for the comment! Agree, renting a car in Ireland is an absolutely wonderful experience — and it’s definitely worth it as long as you are prepared. Thanks for the additional tips! We will be renting a car in Ireland and wonder if Allianz travel insurance covers car rental insurance in Ireland. We have an annual policy and are confused about coverage in Ireland. Hi Georgia – thanks for reading! That’s a great question, but you may need to call Allianz to see if they cover Ireland. Many insurance companies specifically don’t cover Ireland, and I don’t have the details of your policy. Definitely check with them – and if they say they do cover Ireland, then get that in writing and bring it with you to the rental car counter when you pick up your car in Ireland. Be aware that they could give you some trouble still, but it’s worth a shot!